The foundation for Ernest Hemingway's life and work can be found in Oak Park, Ill. His first 20 years in this Chicago suburb, with prairies and woods to the west, prepared him for his life as a writer. His father taught him about the outdoors and to observe nature closely. His mother took him to opera houses and museums in Chicago so he could appreciate the inner life the arts awakened. Hemingway’s family initiated him in the spiritual life of their church where he sang in the choir and reflected on sermons. It was in Oak Park that Hemingway received his only formal education. In school, Ernest keenly observed what was around him and within him to make stories real for his readers. He wrote most convincingly about people, places and events he witnessed firsthand. When Ernest left Oak Park, he would continue to write from his own experiences on four continents, seeking to convey to readers "how it was." His writing touched what was common in all people's lives. In 1954, he was recognized with the Nobel Prize for "The Old Man and The Sea" — a novella that reflects his "powerful, style-making mastery of the art of modern narration." Decades after Hemingway's death in 1961, people around the world recall his adventures and new generations of readers find fresh meaning in his stories. Ernest Miller Hemingway is born in what would become Oak Park, Illinois, a western suburb of Chicago. 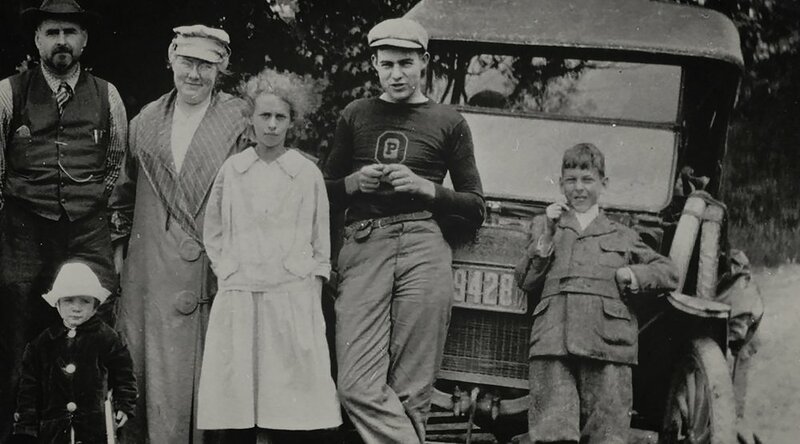 He is the second of six children of Dr. Clarence Edmonds Hemingway, a physician and outdoorsman, and Grace Hall Hemingway, a talented singer and music teacher. Ernest's family takes him for the first time to Windemere, their summer cottage in northern Michigan. Ernest would go there every summer through 1917. Here and back in the Oak Park area, his father would teach him how to observe nature and live in the outdoors--hiking, camping, fishing and hunting. While growing up in a devoutly Protestant family Ernest is taught to sing in church by his mother and later to play the cello. Ernest enters first grade in Oak Park. Ernest enters Oak Park and River Forest High School. He begins writing for the high school newspaper, covering a breadth of curricular or extracurricular activities in which he is a participant or witness. He writes for the high school literary magazine, including poems and short stories, usually drawing on his firsthand experiences. He performs in Beau Brummel, the senior play, just one example of his wide range of activities over four years, including studying a challenging liberal arts curriculum, playing team sports and debating. Graduating in June, he takes a job as a reporter for The Kansas City Star. Here he would learn to observe and write for a large audience, focusing on the essence of universally compelling experiences, using concrete details and short, economical, unsentimental sentences. On May 23 he sails to Europe to drive an ambulance for the Red Cross in Italy. Volunteering to distribute chocolate and cigarettes to frontline Italian troops, he is badly wounded in Fossalta on July, and is baptized by an Italian Catholic priest. He later falls in love with a nurse, Agnes von Kurowsky, while recuperating in Milan. Hemingway is the first American wounded in World War I. He returns to United States to a hero's welcome. While recovering from his war injuries in Oak Park, he receives a letter from Agnes rejecting him, and saying as he wrote, "She hoped he would have a great career." He takes a job with Cooperative Commonwealth, a journal for Midwestern farmers. He marries Hadley Richardson on September 3. He takes a job sending feature stories from Europe to The Toronto Star. With letters of introduction from author Sherwood Anderson, he and Hadley move to Paris. In Europe, Hemingway covers a wide variety of events, including a war and a peace conference. He meets the poet Ezra Pound in Paris who, along with authors Gertrude Stein, F. Scott Fitzgerald and James Joyce, come to appreciate Hemingway's work. Hemingway would be aware of their intense aesthetic currents, responding to some of them in his own writing. Pound's compressed poetry, for example, would complement the spare style Hemingway learned as a journalist beginning at The Kansas City Star. He sees his first bullfight at Pamplona, Spain. He returns to Toronto, where his son, John Hadley is born in October. He resigns from The Star and returns to Paris to write fiction. His first book, Three Stories & Ten Poems, is published. He assists Ford Maddox Ford in editing the The Transatlantic Review, which prints his work. Several of his best-known short stories are published. In Our Time appears, containing several stories set in Michigan about the maturation of a semi-autobiographical character named Nick Adams and concluding with "Big Two-Hearted River." Hemingway finds a publisher for his books for the rest of his life, Charles Scribner's Sons. Charles Scribner's Sons publishes his popular book, The Sun Also Rises. He publishes Men without Women, a story collection including "Hills Like White Elephants" and "The Killers." The latter is the only filmed version of nearly twenty stories by Hemingway that he said he liked. Divorced by Hadley, he marries Pauline Pfeiffer. He and Pauline leave Paris and move to Key West, Florida. His son Patrick is born. Ernest's father kills himself with a .32 revolver. He publishes A Farewell to Arms- to good reviews and sales, despite Boston censorship of the serialized version in Scribner's magazine. It is a poetic, sparely written novel of love and war in Italy during World War I. He breaks his arm in an auto accident near Billings Montana. This is only one in a series of many accidental injuries to his arms, legs, and head, that plague him throughout his life. His son Gregory is born. He brings out his book on bullfighting, Death in the Afternoon. He publishes Winner Take Nothing, a book of stories including "A Clean, Well-Lighted Place." He goes on safari to Africa, the setting for his two long stories "The Snows of Kilimanjaro" and "The Short Happy Life of Francis Macomber" (both published in 1936). He publishes Green Hills of Africa, an account of his adventures on a safari. He serves as a war correspondent during the Spanish Civil War. He contributes funds to the Loyalist cause, and publishes To Have and Have Not, his most overtly political novel. He publishes Fifth Column and the First Forty-nine Stories, composed of a play about the war in Spain and his stories to date. He marries writer Martha Gellhorn, and publishes For Whom the Bell Tolls, his best-selling novel about a band of guerrillas fighting on the Loyalist side in the Spanish Civil War. He outfits his boat the Pilar to hunt down German submarines in the Caribbean. None are found. As a war correspondent, he observes D-day and attaches himself to the 22nd Regiment, 4th Infantry Division for operations leading to the liberation of Paris and the battle of Hurtgenwald. He begins a relationship with newswoman Mary Welsh. Martha Gellhorn divorces him in December. He marries Mary in March. They live in his Finca Vigia in Cuba and later in a house in Ketchum, Idaho. He Publishes Across the River and Into the Trees, a novel about a December-May romance set in post-World War II Europe. Many reviewers attack it, asserting that Hemingway had lost his touch. He staunchly defends it, however. It is more favorably received near the end of the 20th century. The Old Man and the Sea, a novella, is printed in its entirety in a single issue of Life magazine. It is a triumph for Hemingway after several years when the public and critics wondered if he was through as a major writer. His story's hero, Santiago, is a nearly destitute old Cuban fisherman who reveals his humility, sensitivity and courage. On his crucial fishing voyage alone in the Gulf Stream, he has no material success, but seemingly universal spiritual experiences and insights. Charles Scribner's Sons' first book edition was 50,000 copies. In January, he is severely injured in two successive plane crashes in Africa. He is reported dead in some accounts, but soon afterward he meets the press, telling them, "My luck she is still good." He is awarded the Pulitzer Prize for "The Old Man and the Sea." In declining health, he follows the Antonio Ordez and Luis Miguel Dominguin bullfights and observes his sixtieth birthday in Spain. Based on his bullfighting experiences he writes a nonfiction work, The Dangerous Summer, for an issue of Life magazine. It is the last work published during his lifetime. It is one of several manuscripts to be published in book form after his death. He undergoes shock treatment for depression. On July 2, he kills himself with a shotgun. He is buried in Sun Valley, Idaho. This chronology is based on information obtained from The Cambridge Companion to Ernest Hemingway, Scott Donaldson, editor, published by Cambridge University Press, 1996, and Ernest Hemingway A-Z: The Essential Reference to the Life and Work, Copyright 1999 by Charles M. Oliver, published by Facts on File, Inc., New York, N.Y.